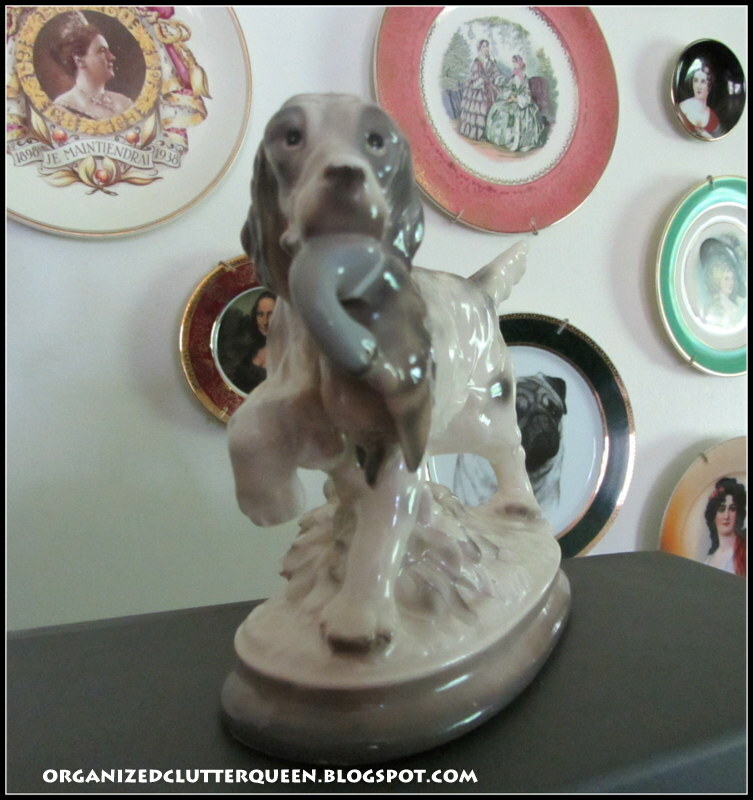 A Clock, a Dog, a Bowl, and a Tablecloth! The only thing these items in the post title have in common is that I found them and purchased them this week! And maybe that I love them all too! First, this great vintage figurine (Enesco Japan paper tag), a Spaniel with a duck in its mouth. $3. No chips or cracks but the figurine was sticky and scummy so I put it in hot soapy dishwater and this happened on the back. There were areas of gray, cold paint on the base that starting flaking off. Thank goodness it was the back side soaking in the hot water. 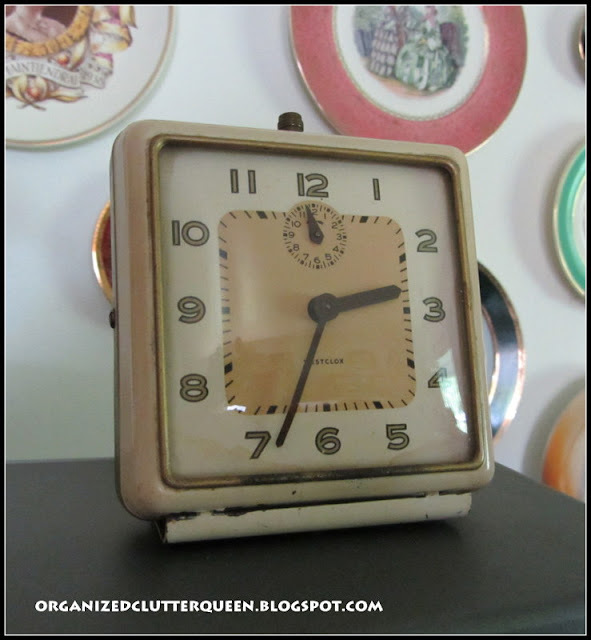 I picked up a vintage Westclox wind-up square clock. This is my second clock in about three months. One more makes a collection! $5.95. 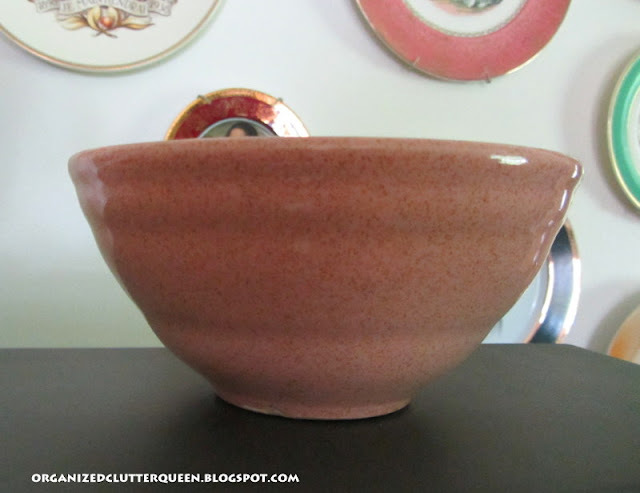 I already am a full-fledged bowl collector, and this pink speckled (Pfaltzgraff USA marked) small bowl is a perfect addition to my collection at $3. 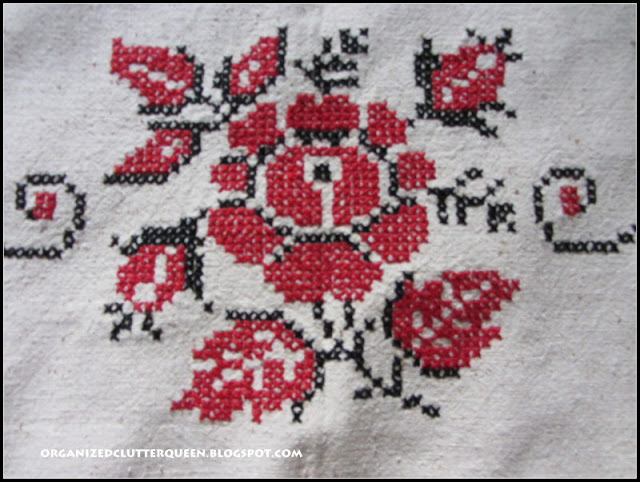 And, lastly, this cross stitched beauty in red and black thread. $25, but worth every penny! The background is a nubby muslin or course fabric. This is a rectangular tablecloth but I am planning another purpose for this! Stay tuned! I love the doggie. I have a Springer Spaniel but he doesn't have a duck in his mouth. Not sure what he would do with a duck. He'd probably be scared. Love that clock, I don't have a square one yet. 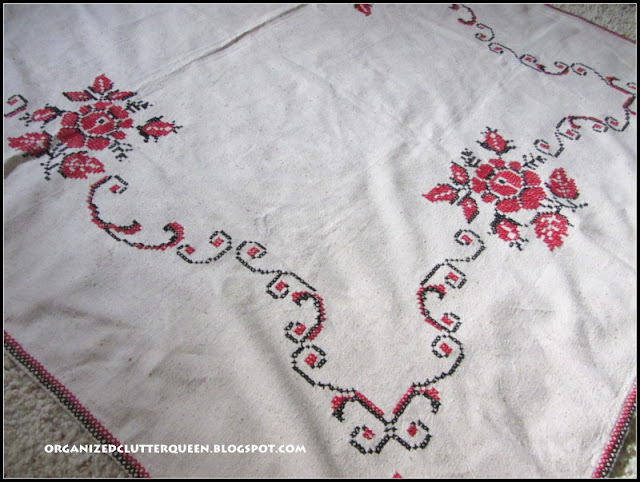 Got me guessing "what is she going to do with the tablecloth"....great treasures. 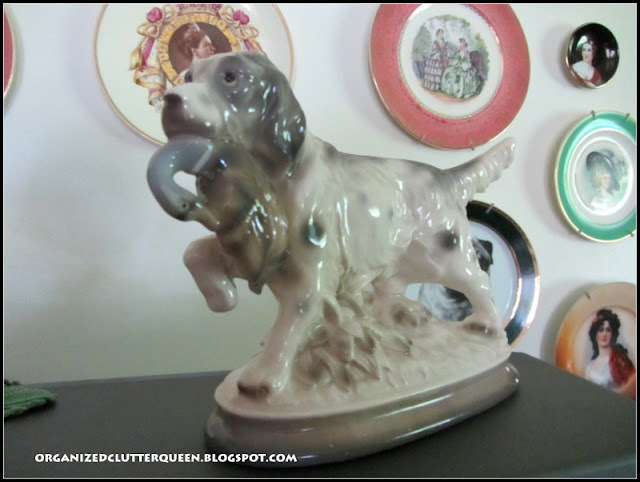 Love the dog figurine. I wouldn't mind the part chipping off. Adds character. 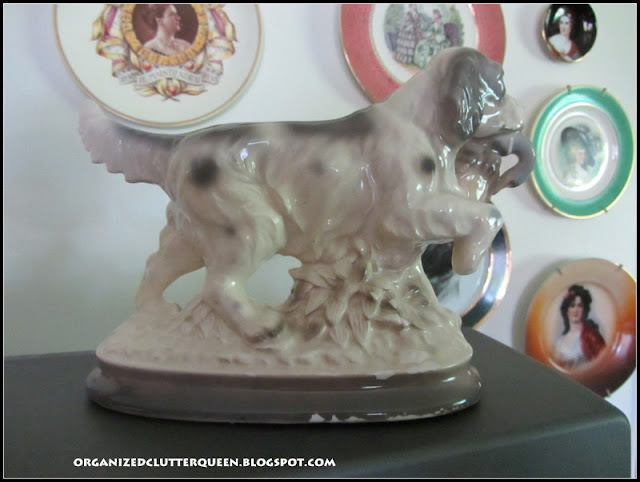 I love old puppies... they are so faithful, even on a shelf! Look at that beautiful coat of colors! Love the clock!!! I've been collecting clocks since I was first married. My tastes have changed, but alarm clocks are still my favorite. Fun finds Carlene! Love the vintage clock. And that tablecloth is wonderful! Great pickins! The dog almost looks like an English piece. Great finds. I love Spaniels and I think that's what your little dog is. I had to laugh at your clock collection comment. I said the same thing when I got my second clock and last week I got my third and did the happy dance. It took me a year to find the three.